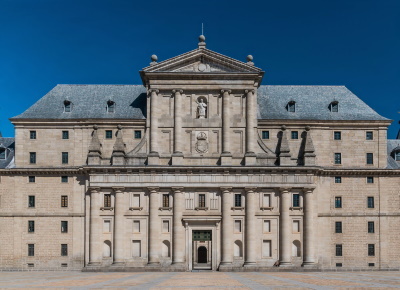 The Royal Monastery of San Lorenzo de el Escorial was built at the behest of King Philip II. It was meant as a dwelling for God on Earth, at a time when the Protestant Reformation was shaking the foundations of Catholic Europa. This unique building has come to symbolise the Counterreformation. Architects of this were Juan Bautista de Toledo and his successor Juan de Herrera. The construction works only lasted from 1563 to 1584. The complex is a basilica, royal palace, monastery, seminary, library and mausoleum in one. I almost missed this one! Really, I could tell some stories about worldheritages that I didn't see because I couldn't find them. Not a good sense of direction I'm afraid. The Escorial actually is situated at the heart of the city San Lorenzo de el Escorial, where I expected it to be in a park somewhat out of town. But a first glance of the huge building was enough to guide me in the right direction. Hundreds, maybe thousands, of fellow visitors were around at its premises. On my tour inside the monastery I was most impressed by the Pantheon de los Reyes, the mausoleum for Spain's royal family. Arriving as it opened, we largely had this massive complex to ourselves. Not that there weren't other visitors, but the structure swallows you in its vastness and very quickly you can find yourself completely alone. 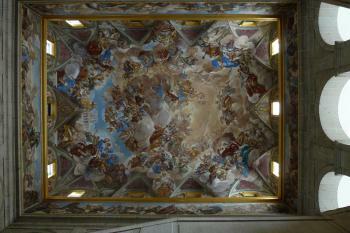 The highlights are surely the painted ceilings and the royal crypt. Both are stunning in their detail, yet they are also more than that. At certain intervals they produce a feeling of grandeur that demands silent attention. I could not help whispering in the crypt, though I need not have since we were alone. 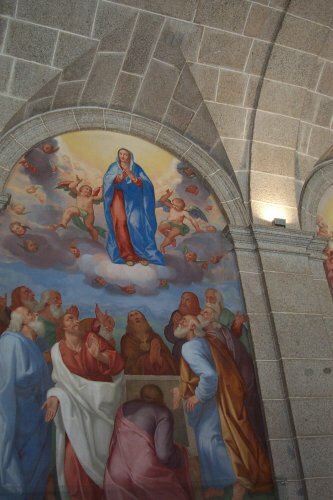 Perhaps, if I was more religious I could better explain it, but the artwork and scale remain with you long after you depart on the train back to Madrid. We enjoyed our visit, but were also surprised that it did not take longer. I believe we spent 2-3 hours exploring. The garden is fairly standard as far as European royal palaces are concerned. Once we finished, we grabbed a bite to eat before heading back. The nearby street, Calle Floridablanca is filled with excellent places for food or drinks. I visited this WHS in June 2015. The historical royal residence and monastery is really huge. It is the second best art museum after the Prado in the Central Spain/Madrid area. Yet I decided to visit the interior and brave the crowds mostly to be able to visit the fine library. I decided to visit after around 4.30pm as it seems to be the quietest time to visit. Apart from the library, I also enjoyed the peaceful green gardens outside. All in all I'm glad I visited but I'm surely not going to return here any time soon. 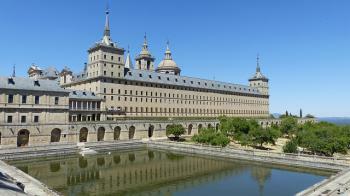 The Escorial is really a great site to visit - it is (supposedly) the world's largest Renaissance building and houses Spain's royal pantheon, yet is built in a somewhat modest style befitting a monastery, which it also is. 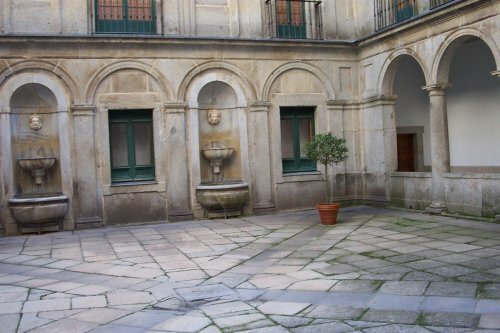 Built in the shape of a gridiron, the instrument of martyrdom of St. Lawrence, it consists of the monastery, a school, and the Royal Palace commissioned and first inhabited by Philip II. His quarters are modestly furnished, but the church, the library, and the pantheon are extremely impressive, although not extravagant. It is set next to a pretty village just about an hour or so from Madrid, and definitely worth a visit for anyone interested in Spain's Golden Age. A hungover traipse around this massive and austere royal palace/ monastery complex wasn't really motivating me to get out of bed after a great night of tapas and bar hoping with my brother and his girlfriend in the Spanish capital. However I finally mustered the strength to roll up to El Escorial on the commuter train that goes through central Madrid. Much to my surprise this severe monument broke me down and I actually started to like it by the time I finished my mammoth stroll around. First off this place is gigantic, it dominates the whole town and just walking around the main route will take several hours. It was also built out of a sense of religious duty by a very devout monarch, as such it is not an opulent explosion of decoration but rather a grey labyrinth of breezy corridors and stairwells occasionally opening up into some vast galleries which once housed one of Europe's finest collections of art. There is a fair amount of this collection left to view in situ; however the real highlights have been moved to the Prado in Madrid. A visit to that museum was the distinct highlight of my first trip to Madrid, and was a great complement to my trip to El Escorial. My distinct highlight was Rogier van der Weyden's Descent from the Cross, the original is in the Prado but there is a very good copy by Michiel Coxie still housed in El Escorial. 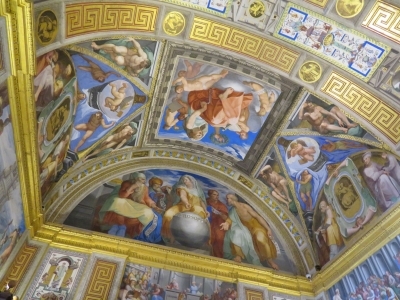 The staggering array of great works is impressive and sits perhaps only below the Vatican as an original repository of such exceptional works of western art. El Escorial also has occasional flourishes of fine decoration which seem almost juxtaposed with the rest of the building, the basilica has some fine frescoes and the painted ceiling of the main staircase in impressive, but seemingly overlooked by many visitors and it is a slight de tour at the end of a mammoth tour. The Royal mausoleum, hall of battles and library are also memorably decorated. After a lengthy walk around the complex I headed back to the station through the nice planned park, in time for the hourly trains back to the capital for more tapas and a match at the Vincente Calderon. I'm not sure I would stretch to saying it was an enjoyable visit, but certainly a very worthwhile trip to make from the Spanish capital. If you couple it with a trip to the staggering Prado museum you can get an idea of one of the most astonishing complexes in European art. We travelled out to El Escorial by Cercanias train from Madrid. On arrival my first impression was of a massive, sinister looking grey building surrounded by a moat. More like a prison than a monastery. I visited El Escurial on a hot Sunday afternoon. While its beauty is undeniable, my memories of the place are overshadowed by a pickpocketing incident earlier in the day. 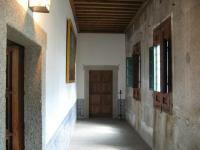 The monastery's exterior is austere at best but the rooms and paintings inside are a beautiful sight. I went on a guided tour (in English) which is rushed and lasts about an hour but I had the chance to retrace the route after my tour ended. The Royal Pantheon where most Spanish kings were buried since Charles I (more commonly known as Charles V since he was also the Holy Roman Emperor) is a must-see. Other places worth seeing include the room where Philip II died (the bed is small but my guide assured me that it was "king size") and numerous priceless paintings by famous artists such as El Greco that litter the building. No photos are allowed inside although I managed to sneak a few shots without flash. 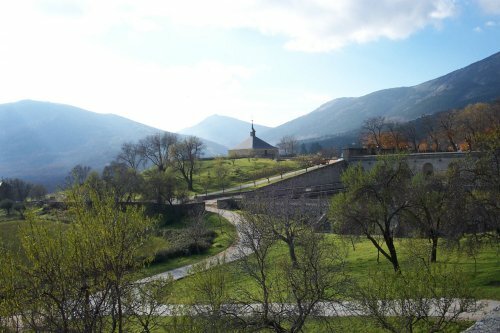 Although I wouldn't say that El Escurial ranks among the best sites in Spain, it's a great day trip from Madrid with easy transportation (many buses and trains go there everyday) and it can also be combined with a visit to the Valley of the Fallen (Franco's tomb) which I unfortunately did not do. 4.5: Stanislaw Warwas Misio_pysio Antonio J.
Neoclassical architecture: 318-002 Subsidiary building "La Casita del Infante"
279 Community Members have visited.